As we know, For more than 11 years now, Amazon Web Services(AWS) has been known as the world’s most comprehensive and broadly adopted cloud platform. The company that is guided by four main principles that include obsession towards the customer rather than focus on the competitor, passion for invention, commitment towards operational excellence, and thinking long-term now for virtual and augmented reality also wants a part of the nascent markets. At midnight, during the AWS reinvent kick-off event Midnight Madness, The retail giant debuted its new software tools on Monday called Amazon Sumerian that was developed intending to help coders to build more easily virtual reality and augmented reality apps with the use of 3D computer graphics. Amazon in Las Vegas announced Sumerian as part of its Amazon Web Services annual cloud computing event. Talking about the software: Amazon Sumerian, Getting started with it is as simple as logging into the AWS Management Console as it requires is no installation of software or upfront costs as the customers pay only for the storage used for 3D assets and in order to access the virtual scenes the volume of traffic generated they create. Amazon Sumerian mainly lets you create and run VR, AR, and 3D applications very quickly and easily without the requirement of any 3D graphics expertise or specialized programming for that matter. With Sumerian, the user can build interactive scenes that are highly immersive and that can also run on much popular hardware's such as HTC Vive, the Oculus Rift, iOS mobile devices, and alongside the support for Android ARCore is also soon to come. The interface of Sumerian’s is said to resemble conventional photo editing software like that of Adobe Photoshop. People can choose tables, trees, and rugs from a library of digital graphics, and then thereafter insert them into their own digital environments. One of its features includes its ability create 3-D animated scenes and to also drag-and-drop digital objects that make Sumerian comparable to video gaming engines like that of Unity and Unreal. 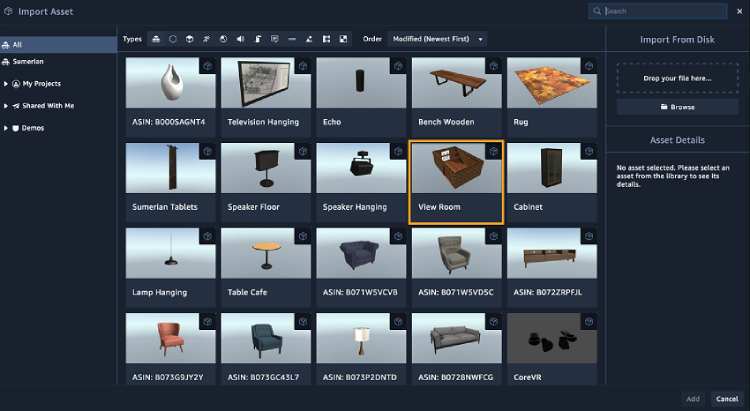 Design immersive VR, AR, and 3D environments: The easy to use editor of Amazon Sumerian allows developers to drag and drop 3D objects and characters into scenes. It also includes templates with pre-populated scenes. 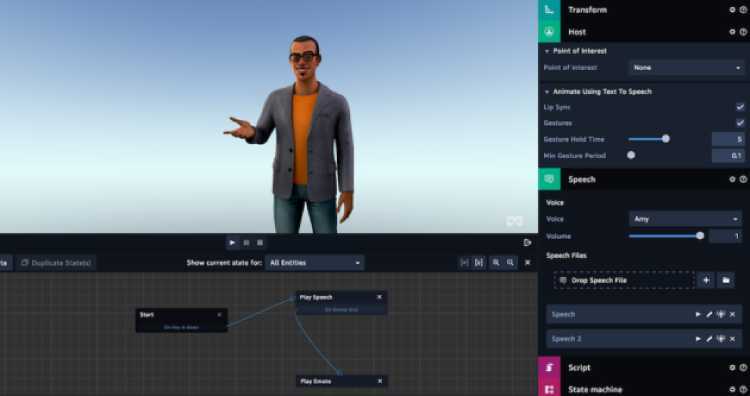 Easily creation of animated characters: Amazon Sumerian can also be used by Developers in order to create animated 3D characters that can guide its users with the help of narration through any scene. It is also in integration with Amazon Polly and Amazon Lex. Deployment of various applications to popular VR and AR hardware: In any browser that supports WebVR or WebGL graphics rendering, scenes of Amazon Sumerian can run. The scenes of Amazon Sumerian are served from an endpoint that is publicly accessible, so that all its users can access them from anywhere and is hosted in the AWS cloud. Jonathan Agoot, who is a Technology Strategist in the Global eBusiness Innovation Center of Excellence said "My experience with Amazon Sumerian has made development of WebVR and Web3D much easier, as I can now easily import my 3D models, textures, and animation so I now focus more on the development of a scene and not have to worry about code anymore." Hence, as of now, it can be rightly said that Amazon Sumerian is The fastest and easiest way to create VR, AR, and 3D experiences.